Anyone living in and driving around the West Suffolk countryside will surely recognise the work of Paul Evans. Thatched cottages by roadsides; churches viewed across ploughed fields; pastures full of flowers; twisting and rutted footpaths – it’s all there in his vivid paintings. The bold splashes of colour catch the eye but be sure to pick out and appreciate the clever detail too. His summer images almost radiate warmth, the sort of blissful, balmy days that take you back to childhood. 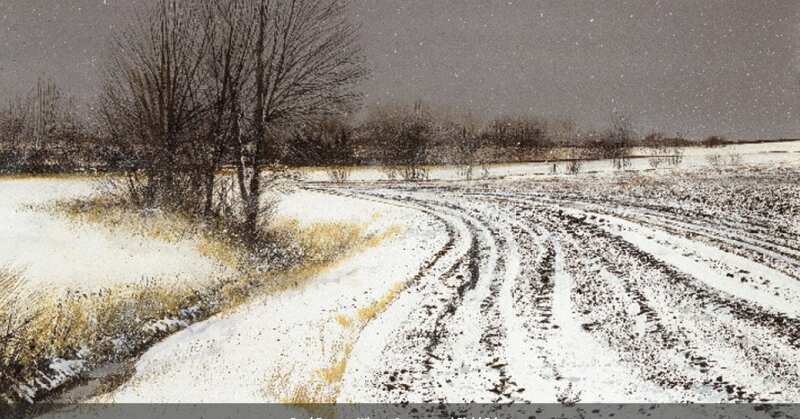 I don’t know whether the azure skies and flower speckled meadows make this an easy time of year to portray but winter certainly doesn’t limit Paul’s creativity. 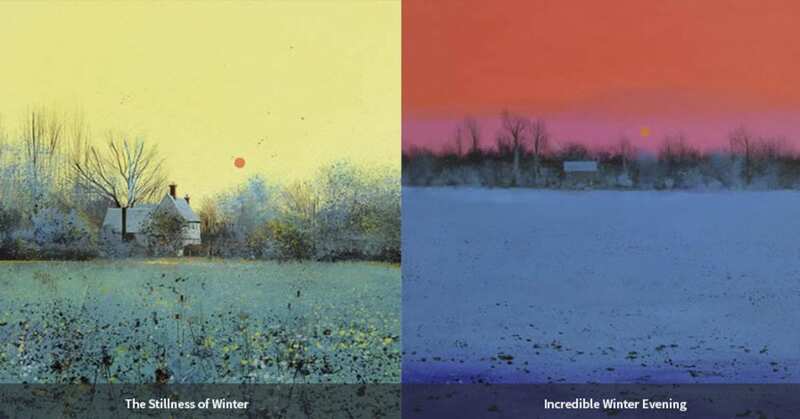 Here we are in the colder months, and Paul, as his latest collection of paintings proves, is truly a man for all seasons. He gets to grips with a so called barren time of year, coaxing wonder out of seemingly ordinary settings and, on first glance, limited colour palettes. If you think the cold months denude the landscape of colour Paul sees it differently, and the pictures in this book splendidly back up his case. He points out that it is the light which can pinpoint something specific in a landscape amongst the greys and whites. It might just be leeting moments as the light moves.I wonder if he is on reconnaissance during the spring and summer to see if somewhere might work well as a winter vista. Study his work at his end of year exhibition in Lavenham and you won’t be surprised to learn Paul’s paintings are a magazine designer’s dream. Rich colours, a variety of perspectives, and images that brilliantly showcase rural and coastal Suffolk as well as several other parts of England too (he often paints in Cornwall, Devon and the South Coast). He has his imitators, people who may try and mimic his style, but there is only one Paul Evans, Suffolk artist. Long may that continue.